The Recording Connection has a lot of prestigious and acclaimed mentors. Among them is Tre Nagella, music producer and chief engineer at Luminous Sound Studios in Dallas, Texas. Tre works with superstar artists like Lady Gaga, Christina Aguilera, Snoop Dogg, Blake Shelton, and, perhaps most extensively, gospel artist Kirk Franklin whose been blowing up the gospel charts for a few years now and with whom Tre won Grammy number two for Hello Fear. Tre also engineered “Wanna Be Happy?” another Kirk Franklin song which just won the 2016 Grammy for Best Gospel Performance/Song. Though the recognition is nice, Tre’s focused on the work and art of making music. In fact, winning in 2008 for Fight of My Life was a complete surprise to Tre who only learned of his win when he got a phone call. When he isn’t winning Grammys, Tre’s in the studio working and passing down his knowledge to others. From getting technical skills to navigating the professional terrain of the industry, Tre is helping Recording Connection students become recording industry professionals who know what the craft is about and how to get on getting-on in the studio. Paying it forward is part of his prerogative. Well keep on taking those Grammys in stride Tre! We’ll celebrate for you. 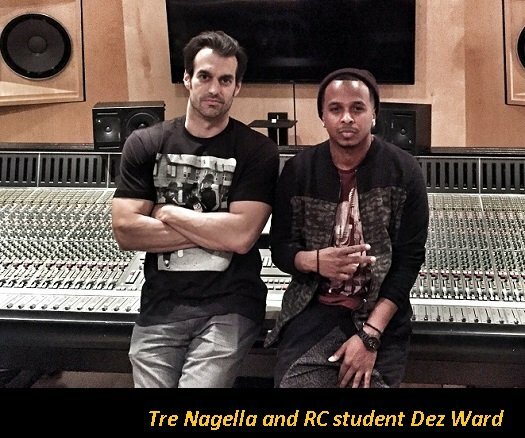 Read up more on Tre Nagella and his approach to mentorship. Ninja Tune wants Recording Connection grads in Los Angeles!